The now completed 400 km electrified fence enclosing the Aberdare Conservation Area (ACA) has improved the livelihoods of millions of people in central Kenya, according to an independent study launched today at the United Nations Environment Programme (UNEP) headquarters in Nairobi. The study, The Environmental, Social and Economic Assessment of the Fencing of the Aberdare Conservation Area, also attributes improved forest cover, safer living conditions for local communities and greater security for wildlife to the fence, which was completed in 2009 after 20 years of construction. The study was requested by The Rhino Ark Trust, the Kenya conservation charity that has pioneered the fence project, with funding support from thousands of Kenyans and friends of Kenya overseas. The study was co-funded by UNEP, Rhino Ark and Kenya Forests Working Group and supported by the Kenya Wildlife Service, the Kenya Forest Service and the Greenbelt Movement. Speaking at the launch, Achim Steiner, UN Under-Secretary-General and UNEP Executive Director, said: “The Aberdares conservation efforts underline the extraordinary and wide-ranging returns possible when a more creative, decisive and sustainable approach to managing nature is undertaken-they also offer a model for exemplary public-private partnerships”. “Indeed Kenya’s new policies on renewable energy to conservation of its water towers including the Mau complex, Mt. Elgon, Mt. Kenya, the Cherangany, and the Aberdares, is demonstrating practically and politically that a transition to a Green Economy is as relevant to a country in Africa as it is to countries across the world,” he added. “The study affirms that the fence has proved a prime management tool in the process of both conservation integrity and ensuring better incomes for all – fence edge farmers, as well as the national and global interests that are derived from the Aberdares as a prime water, forest and biodiversity hot spot,” said Colin Church, Chairman of the Rhino Ark Management Committee. “The study re-affirms that the Aberdares is offering a management and policy blue print for the precious ‘water towers’ of Kenya and other tropical mountain ecosystems and upon which so much human resource is increasingly dependent”, he added. Over the last 15 years, UNEP has been highlighting the vital role of Kenya’s “water towers”, such as the Aberdare Range and the Mau Forest complex, in securing environmental stability, economic development and human well-being. The financial and technical support to the Aberdare assessment study is part of UNEP’s ongoing work in enhancing the understanding of the importance of ecosystem services. The report attributes these improvements to the effects of the fence and associated fence management guidelines as well as more assertive policy interventions. It emphasizes that there should be an integrated management plan for the Aberdares and by inference that future government policy should incorporate holistic approaches to the way high value mountain forest ecosystems are managed. The study also recorded socio-economic effects, such as higher household incomes and land values (as high as 300% in some cases) due to improved farmland security, crop yields and safer living conditions. Wildlife crop destruction has been all but eliminated and children travelling to school face fewer risks from animals. The number of fence edge communities growing wood lots for farm fuel is increasing. In some areas, communities have initiated indigenous tree re-planting inside the fence where previously illegal logging, uncontrolled cattle grazing and indiscriminate cultivation were rampant. Cattle rustling using the forest as an escape route has ceased and disease transmission between wildlife and livestock has greatly reduced. The report confirms that wildlife populations have increased, though poaching remains a threat. It confirms that whilst the fence protects farmers’ land, it is not, nor was designed, to be human proof. The report calls for stricter gate access policies to regulate access to the Aberdare Conservation Area and to tackle illegal activities inside the indigenous forest areas. On water resources, the report says limited data indicates that the Aberdares rivers are “more stable than the Mount Kenya rivers” – a fact it attributes to better land cover in the ecosystem. The report’s economic analysis gives a breakdown of identifiable benefits provided by the Aberdares to many parts of Kenya. The value of providing domestic water supply to central Kenya, parts of the Rift Valley and the Tana River valley, for example, is estimated at KES 646 million (US$ 6.9 million) annually. For Nairobi, where almost all the water supply comes from above and below ground Aberdare sources, the value given is KES 1.46 billion (US$ 15.6 million) annually. The Aberdares is a key contributor to hydropower, which represents 58% of the national total installed capacity. The mountain range is a core provider of water for the horticulture and floriculture production around Lake Naivasha and is also vital to the Ewaso Nyiro River, which flows into Laikipia and the arid northern rangelands. On carbon sequestration and soil erosion control, the report assesses the annual value at just under KES 1.9 billion (US$ 20.3 million). . Carbon credits account for KES 450 million (US$ 5 million) annually. The report stresses important values to fence adjacent communities and key revenues from the Nyayo tea zones and tourism. Total products and services values are put at KES 39.3 billion (US$ 420 million) and biodiversity at KES 20 billion (US$ 214 million) – an overall total of KES 59.3 billion (US$ 633 million). The overall distribution of economic benefits from the Aberdares gives the central Kenya/Rift Valley area 71 %, whilst the total national benefit is logged at 12%. The fence adjacent communities receive 7.6% of the total cake. The global value from agricultural exports, tourism and biodiversity is just under 7%. In per capita terms, the 40,000 families whose land borders the fence and gazetted forest line are receiving by far the largest value benefits at KES 14,580 (US$ 155) per capita compared to a regional figure of KES 4,661 (US$ 50) per capita. However, despite these substantial positive changes, the study affirms that the fence is under-supplied in both human and capital needs. It recommends that the Ministry of Finance be further sensitized as to the value of the Aberdare ecosystem and to provide appropriate budget allocations to its overall contribution to the economy and GDP of Kenya. The report affirms that a public-private partnership using a trust mechanism should be formed, which would enable stronger ‘participatory management’ by communities with the relevant government agencies. It stresses that there is an urgent need to ensure a properly implemented gate management and access policy for gazetted (vis Ã vis national park) forest areas. The report proposes that given adequate financial and human capital support through immediate Treasury funding, the long term financing could be derived from Payments for Ecosystem Services (PES) mainly from water and electricity users. In addition to ensuring ecosystem stability, PES could then be re-directed to accelerate income generating and non-exploitive activities for fence adjacent farmers. The study recognizes that the fence adjacent communities could place new exploitive pressures on the forests and so need greater long-term support to create income activities that are compatible with conservation. 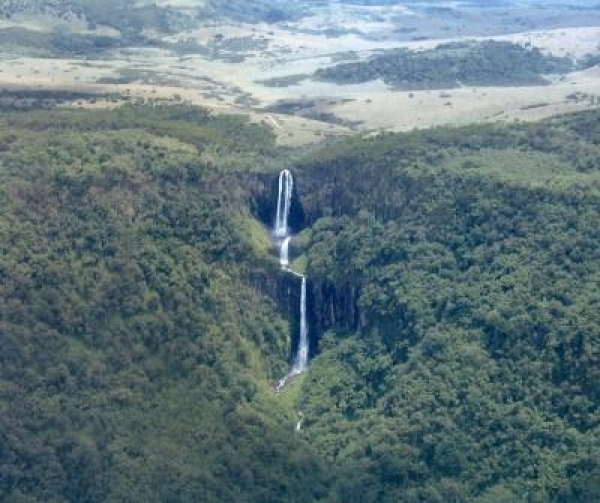 The Aberdares mountain range’s Karura Falls, the tallest waterfalls in Kenya.